Beautiful historic buildings home to two churches, the Wesleyan and the United Baptist Church in the small town of Seal Cove in New Brunswick, Canada. 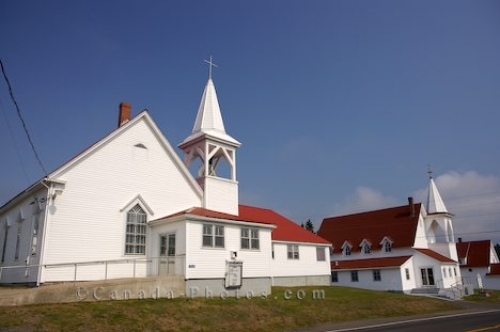 Two churches standing side by side in the town of Seal Cove in New Brunswick, Canada are home to the Wesleyan Church and the United Baptist Church. The church in the foreground is the United Baptist Church , a fair bit larger than the Wesleyan Church. Both churches are adorned in white paint with red roofs and crosses displayed on top of the tall steeples. This small town was once a fishing village, but by 1880, farmers were beginning to move in and in 1882, a granite quarry was opened. The landscape surrounding Seal Cove has beautiful native flowers which has made this an important place in the eyes of botanists. Seal Cove is still a very quiet destination in New Brunswick where a majority of residents attend one of the churches on a weekly basis. Summer homes, campgrounds, cottages and cabins have made Seal Cove the ideal summer getaway. Picture of two churches, the Wesleyan and the United Baptist Church in Seal Cove along the Fundy Coastal Drive in New Brunswick. United Baptist Church and Wesleyan Church in Seal Cove, Grand Manan Island, Grand Manan, Bay of Fundy, The Fundy Isles, Fundy Coastal Drive, Route 776, New Brunswick, Canada.